The Great Ocean Road is one of those dream destinations that you always hear about but never think you could actually visit one day, kind of like Uluru or the Great Barrier Reef. My Australia trip was all about ticking off dream destinations from my travel bucket list, and considering my best friend was based in Melbourne for 6 weeks for an internship, how could we not explore the Great Ocean Road? We did a weekend road trip on the Great Ocean Road since she then had to be back at work Monday morning, and found it to be the perfect amount of time to see all the main stops on the Great Ocean Road. This Great Ocean Road 2-day itinerary will show you all the best things to do and the best places to stop at when you do a Great Ocean Road self-drive road trip. Before jumping straight into the explanation of the best places to stop at during this road trip I wanted to include a map of our Great Ocean Road self-drive itinerary and of the key attractions. The geographer in me sometimes makes a come back and finds it easier to make sense of a trip or location if I have a map to look at. The whole length of the Great Ocean Road is 664km, drivable in around 9.5 hours if you were to do it without stops. The itinerary I have outlined will take 2 days and is optimal for weekend trips. We woke up bright and early on Saturday morning, as we had to pick up our rental car first and we knew it could take some time. Once we had all the paperwork sorted we hit the road with our rental car, excited to finally be enroute to the Great Ocean Road. Torquay is a small seaside town that is also the official start of the Great Ocean Road. We drove through the town and went straight to the esplanade to enjoy the beach vibes. We were there in April, which is the aussie autumn so the beaches weren’t too busy, however if you’re visiting in summer be ready to find them packed with surfers and beach goers. I would have loved to do a surf class somewhere along the Great Ocean Road but it wasn’t really the right season and we were a bit short on time. If you’re visiting in summer and want to spend more time by the sea than chasing waterfalls inland, definitely add some surf time to your itinerary. Pretty soon after you set off from Torquay you will come across Bells Beach, a world famous surfing spot. Bells Beach hosts every year since 1962 the Rip Curl Pro, the world’s longest running surfing competition. It’s a pretty big destinations for surfers basically. For non surfers you can walk along the edge of the cliffs on the wooden walkways and watch the surfers on the waves far below, or head down the steep steps and walk along the beach. Even if you don’t surf it’s still a very scenic beach and a lovely spot for a walk. Because an iconic road trip wouldn’t really be quite as iconic without a big sign to point it out right? I was surprised to find that the Great Ocean Road sign is so far into the road and not at the start, however regardless of where along the road it is if you don’t take a photo of it, have you really been on a Great Ocean Road trip? There’s a small parking area close to it, I guess they knew people would want photos of it and prepared accordingly! There’s also a path that will take you to the beach if you want to go for a dip in the sea or just walk on the beach. Lorne is a small town along the Great Ocean Road and the perfect spot to stop for lunch after a morning of driving. Along the Great Ocean Road and seaside you will find a row of cute coffee shops, restaurants and pubs with outdoors seating space. We parked close to the sea and wandered around for a bit until eventually settling on a classic Aussie burger for lunch. If you’re not in a rush you can spend some more time wandering around the town and shops before hitting the road again. Wherever I go, if the location allows it, I love to go waterfall chasing. The areas that surround the Great Ocean Road are full of forests, national parks and waterfalls that you can explore. Since we only had two days we decided to focus on the ones that we thought seemed most spectacular. For our first day on the Great Ocean Road we went to Erskine Falls; a 30-metre waterfall that cascades into a deep gully. There are two viewing platforms, one at the top of the falls that gives you a view over the falls and river below, and the other at the base. The walk to the base is pretty steep but not unreasonably long, we found that it wasn’t too challenging physically. We were there in dry season so unfortunately there wasn’t much water falling, but it was a pretty stunning surrounding nonetheless. The Twelve Apostles are probably one of the most iconic sights in Australia and on the Great Ocean Road. The Twelve Apostles are huge limestone formations just off the shore of Port Campbell National Park. Their proximity to each other and the coast is what makes it so particular and attractive to the hundreds of tourists that come every day to visit it. It’s an especially popular sunset spot. Since we left Erskine Falls quite late and were afraid we would miss the sunset we actually decided to drive inland and not on the Great Ocean Road (not the most coherent decision for a Great Ocean Road trip!) but the road is considerably shorter and saved us loads of time, allowing us to arrive in time for sunset. There is a parking lot just by the Twelve Apostles from which you can then easily walk to the viewing platforms. There is a long wooden walkway dotted with viewing decks so that you can enjoy the view from different parts of the coast. It was extremely busy when we visited so if you want to get a good spot to take photos, make sure to get there well before sunset. Once the sun was done we set off and drove back on the Great Ocean Road to Apollo Bay, where we stayed for the night. Apollo Bay is one of the most popular stops and main towns on the Great Ocean Road so you will find a lot of other backpackers and road trippers like you at the pubs and restaurants. The town itself isn’t huge, with only one main road of bars and restaurants, which makes it easy to find somewhere to stop for dinner. We then slept at the BIG4 Apollo Bay Pisces Holiday Park. We set off from Apollo Bay early in the morning as we had another packed day ahead of us. We made it to Hopetoun Falls, the first stop of our day, by 8AM and were pleasantly surprised to find we were the only ones there. The walk from the parking lot is pretty steep but it’s an easy trail, with wooden steps in the steepest parts. When you make it to the bottom you will find a viewing platform from which you can look up and admire the three jets that form this waterfall. Hopetoun Falls is probably one of the most beautiful waterfalls I’ve seen, and the fact we were the only ones there added to the beauty of it. As you may have imagined by now, we kind of had a thing for waterfalls on this trip. A short 15-minute drive from Hopetoun Falls you will find Triplet Falls. Triplet Falls, as the name suggests, is a group of three waterfalls that you can visit in the Great Otway National Park. There is a walking trail that starts at the parking lot, takes you to see all the three waterfalls and return via a loop to the parking lot. The whole walk is very picturesque, even when you’re not approaching the waterfalls but just walking through the woods. The whole walk will probably take you around one hour. There isn’t too much driving involved this morning, since after visiting these two epic waterfalls you can head straight to Otway Fly Treetop Adventures, a short drive away from Triplet Falls. This is an area of the Great Otway National Park where you can see up close the treetops of this rainforest, whether it’s with the treetop walk or with a zipline tour. We settled for the treetop walk as we didn’t have time for the full zip-lining tour (it lasts 2.5 hours). We did the rainforest and treetop walk which is around 2km and takes around 1 hour to complete. The entry ticket is 25 AUD. All throughout the walk there are signs with information about the local flora and fauna, while they are geared more towards children they are still interesting to read while doing the walk. The walkway goes up to 25m getting you up close to the tree tops, if you’re a bit scared of heights you might not want to look down! There is also a coffee shop where you can have lunch after all the walking around of the morning and before you hit the road again. Gibson Steps is one of those spots where you can get off the cliffs and down to the beach. There are 86 steps that descend the 70m of the cliffside. The steps are quite steep and narrow but it’s not a particularly challenging walk down (the walk up on the other hand is slightly tougher). Even if it was too cold to swim in the sea (and with waves that big I would have avoided it regardless) the beach is very pretty and with the towering cliffs behind it makes for a very picturesque location for a walk on the beach. After the Twelve Apostles one of the most famous stops on the Great Ocean Road is Loch Ard Gorge. We drove there straight from Gibson Steps which are a short 5-minute drive away along the sea. From the parking lot of Loch Ard Gorge there are multiple wooden walkways that take you to different spots along the coast so that you can enjoy the view over the cliffs from different angles. My personal favourite was the walk down to the beach inside Loch Ard Gorge, since being at the base of these huge cliffs really has a way of making you feel small. Since one epic sunset over the sea and staggering cliffs isn’t enough, I figured it was best to add another one in this weekend itinerary. The Bay of Islands isn’t as famous as the Twelve Apostles however it has nothing to envy to its more popular neighbour. The Bay of Islands is still a part of the Port Campbell National Park and is a short 30-minute drive away from Loch Ard Gorge along the Great Ocean Road. From the parking lot it’s a short walk to the viewing platforms, which you’ll find considerably less busy than the Twelve Apostles. There’s a whole trail set out with wooden boards that you can walk along to enjoy the sunset from different spots along the coast. The sun has set and it’s time to get ready for heading back home, but not before one last stop on the Great Ocean Road. We stopped for dinner in Peterborough as it’s very close to the Bay of Islands and has lots of good choices for restaurants and pubs. The town is also very picturesque with a chilled vibe if you want to walk around and explore after dinner. We chose to drive back to Melbourne via the inland route, as it’s considerably quicker than on the Great Ocean Road along the coast. We figured since we’d spent the weekend road tripping along the Great Ocean Road and we’d seen all the main highlights, we could avoid the scenic route on the way back. If you’re trying to get back to Melbourne at a reasonable time on Sunday night so that you can go to work on Monday morning, I would recommend this approach and itinerary. 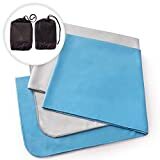 Fast drying towel: I like to carry a fast drying towel with me because whether I decide to go for a surf and swim in the sea, or the hostel doesn’t provide one I prefer to have one always on me. They dry super quick and take up little space so they’re easy to carry around. Reusable water bottle: There’s a lot of walking around involved in this itinerary, so you want to make sure you stay well hydrated throughout the two days. Since tap water is drinkable in Australia you’re better off taking a reusable water bottle with you and refilling whenever you have the chance. Bottled water isn’t expensive but when you add them all it can save you a fair bit. 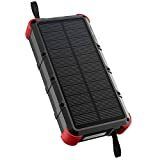 Solar power bank: Yes I spend too much time on my phone, there’s no denying that. I like to say it’s my job to be on my phone but really, when a sunset looks as good as the one at the Twelve Apostles did, you can’t help but take all the photos, boomerangs and videos that battery will allow. That’s why I like to take a solar power bank with me. I can charge my phone on the go and the charger also stocks up on the road, without having to always recharge it at the end of the day. You can read my solar power bank review here. Have you been on a road trip on the Great Ocean Road? How did you find it? Let me know in the comments below! If you’ve done other stops on the Great Ocean Road that I haven’t included let me know, I’d love to expand this list with all the must-see spots on the Great Ocean Road. This is the exact 2-day itinerary that we followed on our trip, I hope you will find it useful in planning your own Great Ocean Road driving itinerary. If you’re looking for more Australian road trip inspiration, check out my Cairns to Brisbane road trip itinerary or my guide to planning the perfect Australian road trip. Enjoyed reading my Great Ocean Road 2-day driving itinerary? Pin it! Thank you! I have wrote lots of notes for our road trip! Will report back on how we get on! Some great advice and notes. Thank you for the tips 🙂 – made planning my trip so much easier!